Nowadays the trend of traditional clothes are increasing and people like to wear these type of clothes. Rajputi Poshak is a traditional dress that has always been in trend because of its cultural and traditional look. Rajputi Poshak is also considered as a royal dress of Rajasthan because it was worn by the Rajputi Maharanis of Rajasthan in ancient time. From that time this dress gains the badge of royalty. This dress reflects the natural attire of Rajputi women. Rajputi Poshak also comes in very vivid designs and colors, which is very graceful and traditional. It comes in various types like Multicolour Rajputi poshak, Bridal Rajputi Poshak, and Handicraft Rajputi Poshak. The upper body wear of this dress consists of Kanchali and Kurti. It shows the culture and heritage of the people of Rajasthan and provides a feel of royalty. Coral, sequins, mirror work and creative cut work is done on the poshak to get a stunning look. Rajputi poshak mainly comprises of four garments. For the upper body part, there are two garments, Kurti and Kanchali. For the lower part, there is Ghagara. The fourth garment is the Odhani. The entire attire comes in many different and beautiful colors, prints, fabrics, and designs. A long skirt which touches the feet. Cut in short “Kalis” to add width and grandeur at the bottom, more the “Kalis” more the glory of Ghagra. Tailored with different fabrics in varieties of color, designs, and prints. Kurti is worn over the kanchali. Stitching a kurti kanchali is a complicated technique and not everyone can do it. You need specialized tailors for this. A long piece of 2.5-meter transparent cloth, made with mild fabric usually georgette, chiffon, tor etc. The Odhani’s are usually lightweight. Odhani completes the attire. The wearing style of odhani is different in different communities in Rajasthan. Covering the head with Odhani adds dignity and grace to women. Embellish look can be given by adding patches, embroidery, and some light zari work. If you want various designs of Rajputi Poshaks then no doubt Royal Ranisa is the best place for you and you will not be disappointed with them. Marwadi Rajputi poshak is well known all over the globe. Yellow Rajputi poshak has its own uniqueness. The yellow poshak is beautifully carved with a golden embroidery design, which makes it more graceful. Royal Ranisa is offering Shining Rani color Rajputi Poshak, keeping in mind the culture and their royal heritage. The Rani color Rajputi poshak also comes in varied designs. Dark Green Rajputi poshak is full of embroidery work. The poshak is full thread embroidery work that is perfect for special occasions and social gathering. You can feel a complete look of Rajputana when you wore it. The red color poshak comes from royal red with thread embroidery looks incredible and elegance when worn on wedding function. The royal red color comes with different designs. This poshak is mostly bought in wedding seasons. Light pink Rajputi poshak with golden color embroidery work is the perfect poshak for a traditional dress lover. You can also ask for thread embroidery work on the lehenga that will give you extra luster in the poshak. Royal Ranisa offers Rajputi Poshak, Lehengas, odhani, fancy dress material with awesome price and finest quality. An Exclusive Range Of Royal Rajputi Indian bridal wear collection for reception, sangeet and wedding day available in different colors and styles are available at Royal Ranisa. 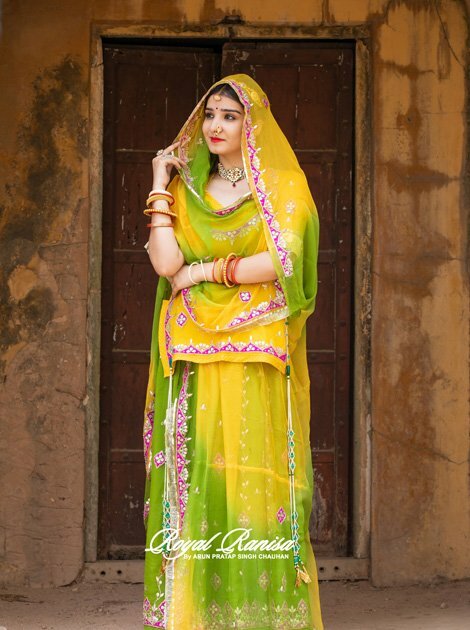 We offer Royal Rajasthani wedding wear, Indian wedding dresses, bridal wear outfits in a wide range of choices. Kundan is a stone which keeps on the Royal rajputi poshak gives a touch of uniqueness. The word kundan means pure gold and it is one of the oldest stones made and used in India. A marriage function or a social gathering on this types of special events mostly women chooses poshak in gota patti. In this other embroidery stuff like sequences and kundan is used. Zardosi is used to bring originality in the fabric. Zardosi is pleased with the small and thin metal wires that look more attractive to the Rajputi Poshak. When it is embroidered on poshak, it enhances its beauty. Zari is a very fine material to be used on Rajput Poshak. In fact, this thread is mostly used in Varanasi but now it is used in different parts of India and even outside of India. Zari is usually a brocade of thread that is used for knitting and embroidery. Royal Ranisa in Jaipur is the well-known place for best quality Rajputi Poshaks. 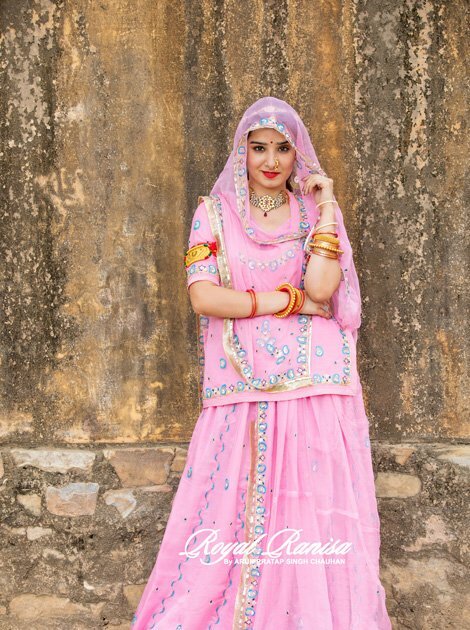 They provide this royal dress in various colors and designs with a great piece of embroidery work done on them by the experienced artisans and workers of Royal Ranisa. Nowadays traditional Rajputi poshak is in trend. But the bitter truth is that the same design is in the chain. No uniqueness is offered to the customers in terms of design. But we offer you a unique design every time you visit us. Our products are designed by professionals. We offer colorful embroidery, zardozi, gota patti sequins and much more work on your poshak. Royal Ranisa is in the process of aggressively expanding its product range and continues to invest in bringing the best products to its customers. Furthermore information please contact us. Royal Ranisa in Jaipur is the well-known place for best quality Rajputi Poshaks.